"I tell you that you must do better than the teachers of the law and the Pharisees. If you are not better people, then you will not enter the kingdom of heaven." Jesus repeatedly and even deliberately enters into conflict with the Pharisees and Scribes in Matthew's Gospel. Why? Why are Jesus' most scathing denunciations directed at those most recognized as the religious in his society? Jesus is concerned because God's truth often got lost in their arguments over theoretical and picky religious subjects. Their goal seemed to revolve around trying to justify themselves and their actions without displaying the righteousness and grace of God. Jesus wants his disciples to demonstrate the intent of the Law in our lives. He wants us to display the heart and character of God as his children in our daily lives. He wants his disciples to be a new generation that has living the righteousness and grace of God as its consuming passion. 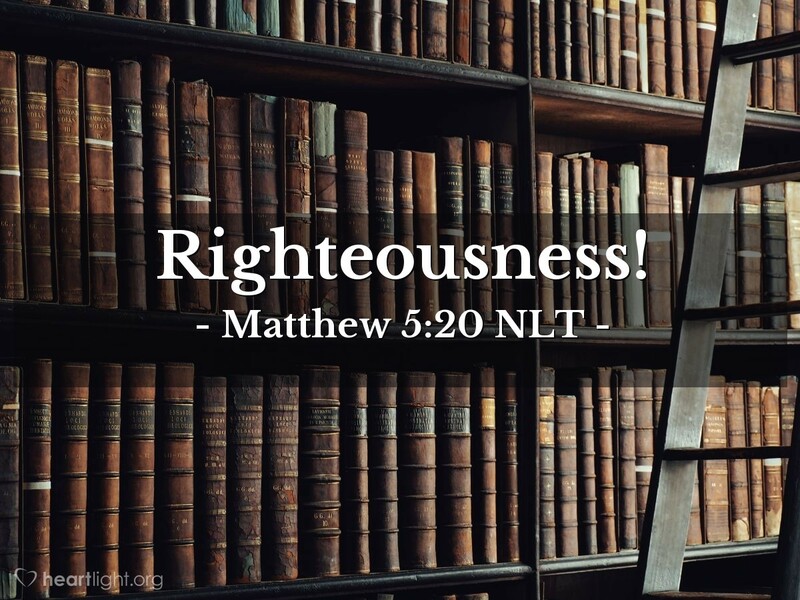 Father, I want to be righteous. I want to live my life in a way that reflects your love for the lost, your compassion for the broken, your passion for holiness, and your disdain for hypocrisy. I know that this holy life is not possible on my own, so please cleanse me and make me holy by the power of your Spirit. Please bring forth the righteous character of your Son in me. In Jesus' name I pray. Amen.